It was all in a day's work for slick animal control officials Wednesday in San Francisco as they rescued a raccoon that found itself in a rather precarious position. 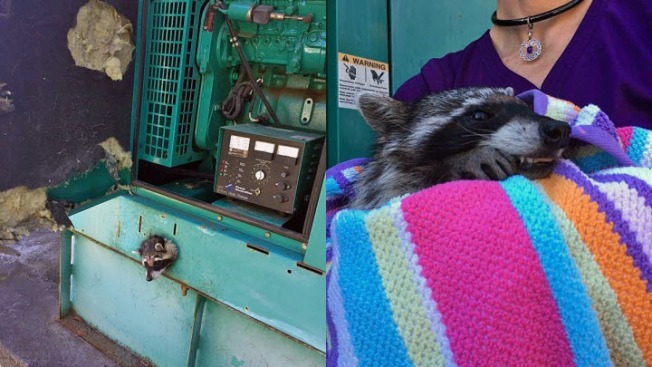 The raccoon was found stuck in a generator on the City College of San Francisco campus, according to Acting Lt. Eleanor Sadler of San Francisco Animal Care & Control. The animal's head was protruding through a small opening at the front of the steel-paneled generator while its body appeared to be inside the large machine. A responding animal control officer was unable to free the raccoon initially as it was too upset and was thrashing around, Sadler said. "We transported the shelter veterinarian, Dr. Faith Albright. to the scene to sedate the raccoon," she said. "Once unconscious, we were able to lube her up with baby oil and pull her out." The raccoon was brought back to the SFACC shelter, where it was examined, declared fit and released to a nearby location. "She scampered off happily," Sadler said.